I have a thing for mail trucks. I’ve sketched them several times, usually when I’ve seen them parked in the ‘hood. I know their drivers will be back soon, so I enjoy the challenge of sketching as fast as I can. When I pulled into the Wedgwood Station parking lot, I saw a mail truck next to the building, so I chose a spot directly opposite and backed in. 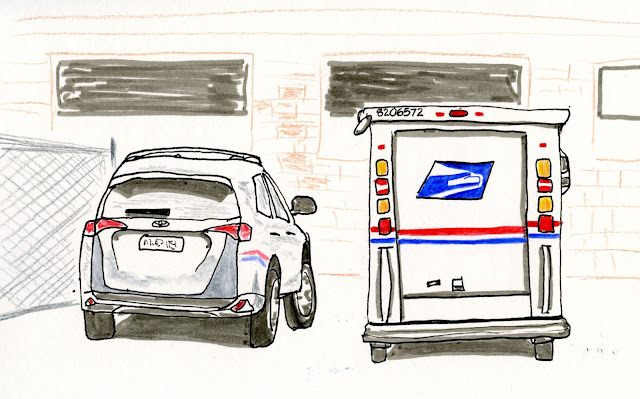 After finishing my postal business, I had an easy view sketching it from my car. It felt lazy – I knew that the truck probably wouldn’t leave until morning. But it was fun to finally have time to get all the stripes and details. When I finished the truck, I saw that the Toyota parked next to it was still there. Now the challenge was on again, because I figured its driver would be back soon. But I guess there was a long line inside – I got done with time to spare.